It's true what William Burroughs said about Jack Kerouac in that he was instrumental in starting a world-wide cultural movement. It's true also that he ended up a drunk, disparaging of the hippy movement that his writing - in particular On The Road - helped create. I think what it is with Kerouac is that he was first and foremost a writer and an apolitical one at that. On The Road though written in 1951 wasn't published until 1957 and Kerouac would have been rightly pleased with the recognition and the huge audience it garnered. What writer wouldn't be? But whilst pleased with the original Beatnik scene in its purest form, the emergent hippy movement was like a Frankenstein's monster that he felt much antipathy to. Patently, Kerouac never had a problem with drugs as supposedly a lot of his writing was done whilst on Benzedrine. No, it was the more overtly political wing of the hippy scene that he disliked, feeling it akin to a communist hi-jacking. 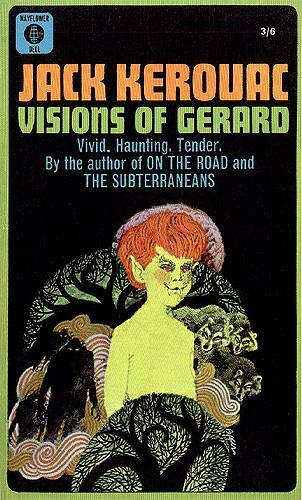 Visions Of Gerard was written in 1956 and is essentially a homage to his elder brother who had died at the age of nine when Jack was just four years-old. It's a beautiful yet rather self-indulgent book but then how could it not be? His brother, Gerard, is described as a near-saint as seen through the eyes of a four year-old though clearly he's actually being described through the eyes of Jack as a thirty four year-old man. There are scenes in it that might well have happened such as Gerard rescuing a mouse from a mouse-trap and trying to nurse it back to health, only for it to be eaten by the family cat. Or Gerard coming home one day with a boy from the neighbourhood who is obviously very hungry; Gerard knowing that his mother would be able to feed him. Events such as this are used to illustrate Gerard's saintliness and allows him to question why God allows such suffering in the world. Gerard's parents and teachers can only tell him that it's just the way it is but that heaven is there as a reward which only causes him to wonder why heaven can't be here and now? Other events are clearly imagined by Jack, such as when Gerard is confessing his sins to a priest and admits to looking at another boys 'dingdong' in the urinal. And whilst this scene is being played out in a little church at dusk, elsewhere in the world wars are raging. Or when Gerard ventures out alone into the cold one evening to fetch his mother some aspirin from the drugstore whereupon he spies an old man returning home from a days work, embittered with the cold and heading back to an empty, leaky room where no mother, father, little sister or brother awaits him. And meanwhile, Gerard's own mother has a headache. "Why did God leave us sick and cold?" he asks his mother "I don't like it. I wanta go to Heaven. I wish we were all in Heaven." "Me too I wish," his mother replies. "Why can't we have what we want? Aw Mama, I don't understand." Kerouac's story is clearly a very heartfelt one and goes a long way to explain what made him the person he ended up as. It reveals the marriage between his Catholicism and his Buddhist leanings along with his quest to find a meaning to life. It's a story that's very easy to criticise but because it's so heartfelt, out of respect for his dead brother and for the impact his death had upon Jack, it doesn't deserve to be criticised. I always thought On The Road was speed jive, like the line out of All The Young Dudes by Mott The Hoople. Visions Of Gerard is more like an opium dream and for this reason they're two very different books in style, mood and content. Of the two, even though On The Road won Kerouac all the plaudits and acclaim, I actually suspect Visions Of Gerard might be the better one.